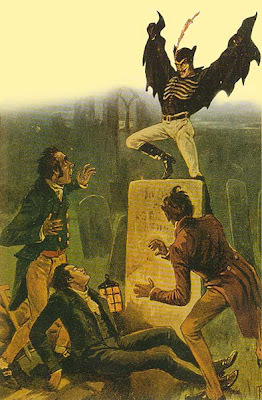 The case of “Spring Heeled Jack” was nothing more than extraterrestrial creatures that came to our planet in contingents of 100 members each, they appeared on Earth around the year 1815 and they stayed here almost one century. Although their presence was recorded in England, they were also spread almost in all the countries of Europe, Spain, France, Italy, Germany, etc., and even America. Their purpose was mainly psychological that is to say; they studied the reactions of human beings and for that reason they used to disguise themselves grotesquely to produce a bigger impact on humans, they used to paint their faces and they also used masks with harrowing expressions to scare their victims. Everything with the purpose of causing a bigger impact and be able to study the reactions of their victims as well. Due to their physical complexion they could not stay on the terrestrial ground because of the difference of gravity between their planet and ours. They had a small anti-gravitational artifact inserted under their skin that allowed them to give those enormous jumps that caused astonishment to those who had the bad luck to be their victims. As a rule they didn't attack to their "guinea pigs", but sometimes they did in order to provoke bigger impact. In occasions when people wanted to capture them, they panicked and they defended themselves as well, but this has to be classified as exceptional cases. Why weren’t they captured? Simply because they were controlled from their space ship through monitors that even recorded the variations of their corporal heat produced by fear, and as soon as they perceived some danger they were teleported immediately. This means that they didn't always escape jumping, but rather they also disappeared. Who could imagine the truth? To conclude, it is necessary to clarify that they didn't have any base on Earth, because their base was directly in their space ship. The planet they came from was called Tax and it doesn't appear in our astronomical charts, it is located approximately at 60 or 70 light years, that is to say at a short distance, relatively speaking. As to their morphology, it is totally different from ours; they even had their feet and hands very similar to a duck foot. Their body was smaller compared to normal human being and it was also weaker. They were omnivorous beings. Obviously their ethics leaves much to be desired due to the way they studied their victims causing panic and observing their reactions. All these data were extracted from the session 26/JUL/05 with Jorge Olguin as a medium, Ron Hubbard came to answer the questions too, but unfortunately the recorder failed that day and the dialogues were lost. Anyway, I clarify that the information exposed here is practically everything Ron Hubbard told us about it, There is only some astronomical info that I couldn’t remember, but I definitely believe that it’s not that important. This entry was posted at Saturday, September 19, 2009 and is filed under Extraterrestrials . You can follow any responses to this entry through the .